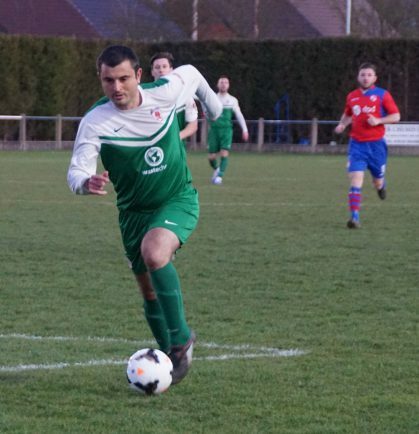 BROMSGROVE Sporting completed the league double over Hinckley last night but had to work hard to get the result against a well-organised side who always looked capable of going forward, writes Phil Baker. Playing on a cool evening, the healthy crowd of 226 were treated to some good end-to-end play for the first few minutes but with few chances as both back fours mopped up any danger. With the mid-field getting crowded, Sporting attempted to open up the game and make more use of the flanks and the benefits were almost immediate. On 11 minutes Daniel Morris moved forward from left-back putting over a delightful cross to the head of Jozsef Jakab whose glance looped over Tom Cross in the Hinckley goal to give the Rouslers the lead. Hinckley showed no lack of commitment as they went for the equaliser and it nearly came on the 25th minute when former Rousler Sean Williams received the ball just in front of the box. He passed to Luke Richards unmarked on the left whose shot beat Chris Jay between the sticks only to see the ball to hit the post and roll along the line allowing Jay to gather. Bromsgrove regained some control in the game and their efforts were rewarded seven minutes later after forcing a corner. Sam Wills floated a well-aimed effort that met the head of Jakab who thundered the ball into the top corner. Before the half-time, Sean Brain’s long-range shot was put wide by Cross and captain Craig Jones headed just over from another corner. Four minutes after the interval, Sam Wills pretty much put the match beyond Hinckley when he found himself with plenty of space and time on the edge of the box to hit a low angled drive beyond Cross for Sporting’s third. With 80 minutes gone Hinckley were still trying to rescue something from the game and a Richards screamer went just over the bar. Then three minutes later they finally got on the scoresheet after a great run down the right by Javia Roberts who crossed to an unmarked Greg Pearson who easily tapped home from a few yards out. Richards forced a late save from Jay but the goal was too little too late as referee Mr Moule blew for full-time after three added minutes and much to the relief of the contingent of travelling away fans behind the goal. Sporting’s next game sees them entertain Coventry Copsewood at the Victoria Ground on Saturday.